Fabric expansion joints accommodate relatively large amounts of movement and some misalignment of flanges. They are also lightweight, easy to install and have good acoustic properties with the addition of insulation bolsters. 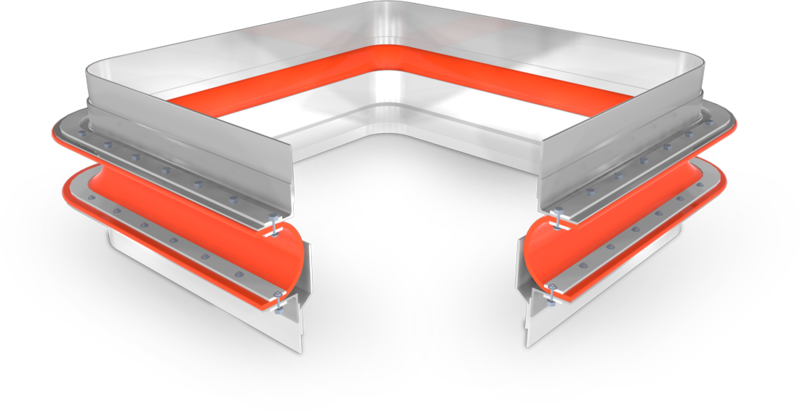 Sometimes a custom-built fabric expansion joint is the only option and we have the capacity to quickly produce, and install if required, the perfect joint for your unique situation. Manufacturing high-quality fabric expansion joints is at the heart of KMK Compensators Ltd. Manufactured to meet your exact engineering requirements, the stitched bellows are made from material to suit your specifications; from high strength fabrics, insulation felts, fabrics coated with selected elastomers and fluoro-elastomer films, metal foils and more. Fabric expansion joints provide more advantages for engineers over metallic expansion joints; with virtually unlimited flexibility absorbing axial and lateral movements; while taking up little space. 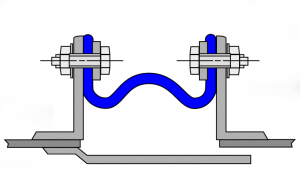 Fabric expansion joints can be easily manufactured to meet your current suite conditions with the advantage of being easy to install; offering engineers and designers a greater scope of options in conditions of low pressure and dry medias. KMK Compensator’s fabric expansion joints are individually designed to provide the best solution to specific applications with emphasis on the supporting metalwork and flange configuration. The design influenced by the prevailing conditions; positive or negative pressure; large or small amounts of movement, axially and/or laterally and velocity. 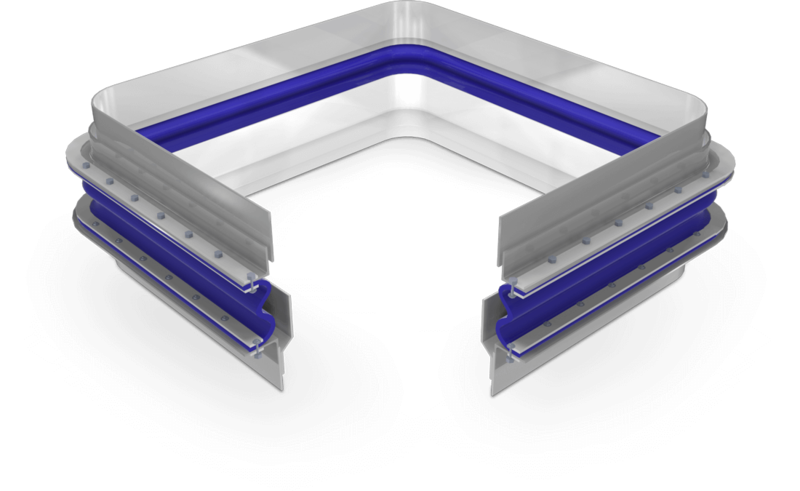 The vast majority of applications can be met with these standard fabric expansion joint profiles. Full range of high performance textiles with which to manufacture fabric expansion joints. Operating conditions can be accommodated by the right design choice. Ranging internally from -60°C to 1200°C; from ambient air to highly corrosive gases. 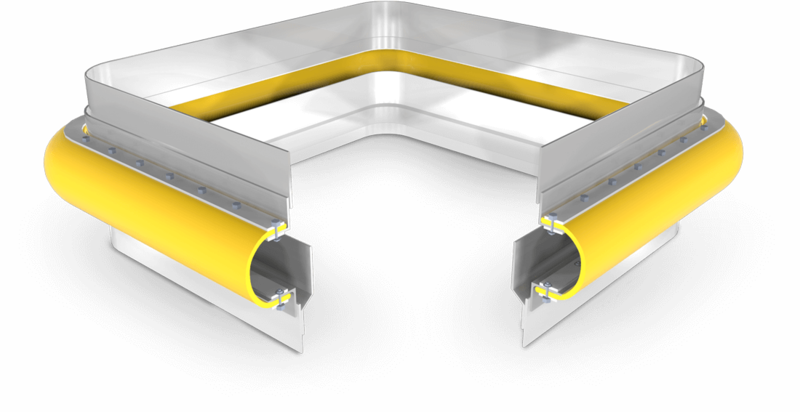 We can supply suitable fabric expansion joints from simple single ply flexibles to multi-layered construction, expertly tailored to fit virtually any application. 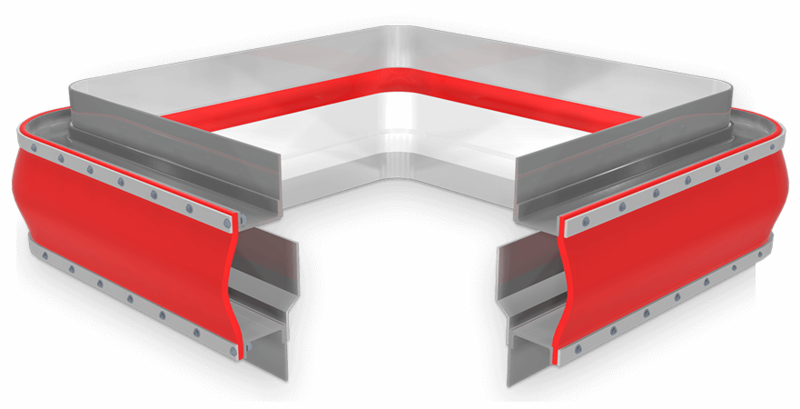 With an additional insulation bolster we can further enhance the expansion joint’s service life expectancy. The storage environment and storage time can be important factors in the condition and performance of a fabric expansion joint. The materials used in fabric expansion joints exhibit resistance to various forms of environmental attack; however, recommended storage practices must be observed and an awareness of deviations must be maintained. In cases of storage abuse, expansion joint warranties may be invalid. 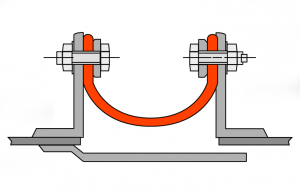 Store the expansion joints in their original shipping state. Protect the expansion joints from physical damage, and or, abuse. Store in cool, dry areas. Do not store where the temperature will exceed 65°C. The ideal storage temperature is between 10°to 20°C. Expansion joints should not be stored near sources of heat such as radiators and base board heaters. Store the expansion joints in their original shipping containers. Protect the containers from physical damage and abuse. Store at least 30 cms above the ground in a dry area where flooding will not occur. Cover the containers with a tarpaulin or heavy plastic to protect them from the weather. Do not store where the temperature will exceed 65°C. The ideal storage temperature is between 10° and 20° C. Expansion joints should not be stored near sources of heat. Expansion joints should arrive at the job site in good condition. The purchaser should, immediately upon receipt at the job site verify that all parts shown on the packing slip have been undamaged. To ensure proper performance and service life it is important to prevent damage by careful handling and by supporting the expansion joint during installation. The breach opening and ducting should be checked for proper alignment and that tolerances are within those specified on the relevant drawings. If the breach opening exceeds these tolerances then the expansion joint manufacturer must be notified. Mounting flanges or expansion joint attachment area of the ductwork must be smooth, clean, flat and parallel. All welded areas must be ground smooth at attachment points. The area around the ductwork must be cleared of any sharp objects and protrusions. If not removable they should be marked for avoidance. The expansion joint and components should be kept packaged until immediately before installation. If any handling devices such as crane hooks or fork lifts are utilised in handling the expansion joints, the contact surface must be protected by cushioning materials. If welding or burning operations are being performed in the vicinity of the exposed expansion joints, fabric welding blankets or other protective covering must be used. These covers must be removed before system start-up. 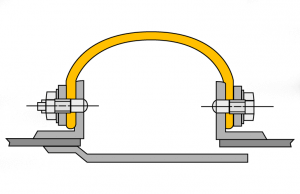 Expansion joints supplied factory assembled on metal frames will be shipped with either static transit brackets or screwed rod transit brackets (this type allows for minor breach adjustment to be made if necessary when connecting to duct ends). NOTE: TRANSIT BRACKETS MUST BE REMOVED AFTER INSTALLATION OF THE UNIT AND PRIOR TO PROCESS START-UP. 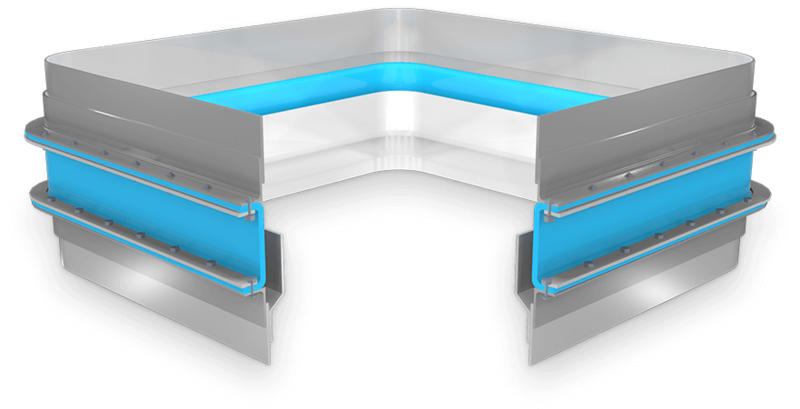 Never extend, compress, or laterally distort expansion joints to compensate for fabrication dimensional errors without the approval of KMK Compensators Ltd.
and requirements for a shield. Proper installation of the expansion joint is critical to the service of the product and should be checked by the installer. When expansion joints have been installed by persons other than KMK Compensators Ltd. approved installers, KMK Compensators Ltd. would prefer, where ever practical, to carry out a final inspection prior to start-up. 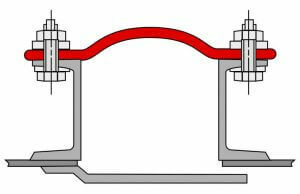 NOTE: Prior to start up actual installed width dimensions of the expansion joints at all corners on rectangular / square, and N,S,E,W on circular, should be measured and logged along with any flange misalignment or offset, this information should be reported back to KMK Compensators Ltd. When the plant has been operational for at least 4 months the above measurements should be taken again whilst the unit is under full load, this information should also be conveyed back to KMK Compensators Ltd.
Generally KMK expansion joints are maintenance free, as there are no serviceable parts. To aid maximum life expectancy of KMK expansion joints, we recommend the following inspection and maintenance procedures. 1. 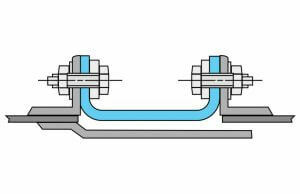 The expansion joints must not be lagged over or covered when in operation, i.e. air circulating around the fabric expansion joints must not be restricted. 2. All bolting should be checked for tightness 2 to 3 days after initial start up and re-tightened if necessary. The bolts should then be checked on a monthly basis. 3. During shutdown periods, expansion joints should be shielded / protected from weld splatter, metal cutting debris and falling objects etc. If protective shields or blankets are used in shutdown periods these must be removed prior to start up.